Music transformed what was, to me, an intolerable morning into a good one. 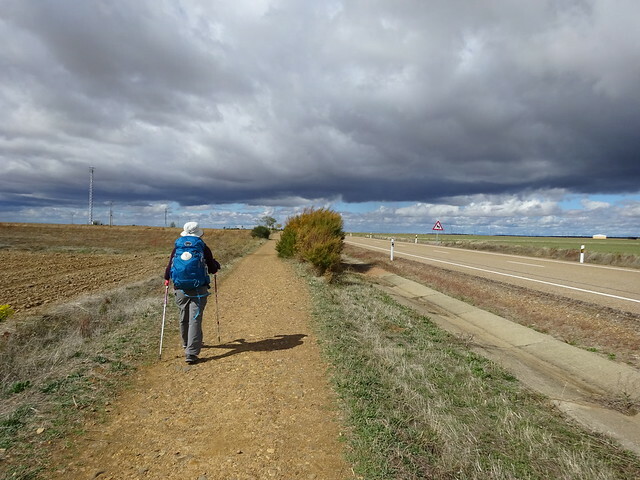 Tania said there would come a time on the Camino that I would want to listen to tunes, so she lent me her iPod and put my favourite inspirational music on it along with her favourites. What I was most grateful for today was her upbeat music. It turned me into The Road Runner with Wile E. Coyote (Dave) in hot pursuit. What fun! This morning I wished I was anywhere but here: on a cruise; back at the beautiful hotel in Carrion; or, at our destination in Ledigos. It was all because of the weather, the same wind and rain we’d had for the last two days. We pushed ourselves against what seemed like gale-force winds that were relentless. 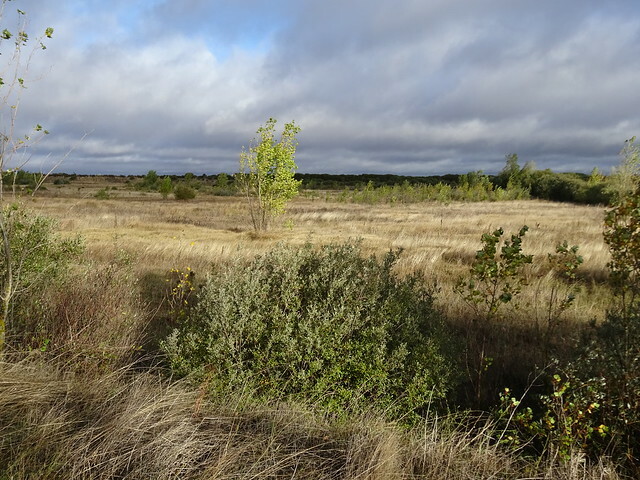 I felt like one of those droopy, brown sunflowers in the field beside us, bending with the wind on their skinny stalks. My eyes were tearing up, my nose was running, and I thought little windshield wipers on my glasses would have been handy. The rain ponchos of the two peregrinos ahead of us were flying up in the air and not serving their purpose. They had to stop and try to secure them as best they could to keep their packs dry. After about an hour, the rain finally let up, but not the wind. We had gone about 7.4 km before I remembered the iPod. I hadn’t listened to it at all during these past weeks. Taking the time to fish it out of my backpack would take five or ten minutes which would make us that much later reaching Calzadilla de la Cueza for a coffee and bathroom break. 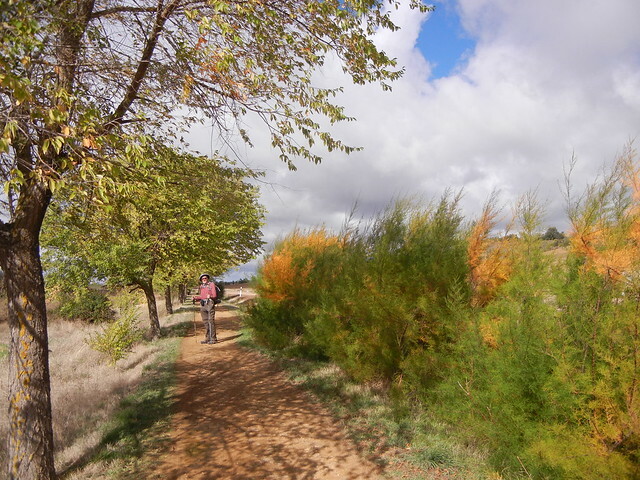 It would also make us later reaching our destination, the Albergue La Morena in Ledigos. But I felt awful and didn’t think I could go on. I had to find out if listening to music would take my mind off my troubles. I dug out the iPod and, as soon as I plugged in the earbuds and turned the volume up loud to block out the howling of the wind, my spirits lifted. Suddenly I had energy! The first song that was playing was one of Tania’s which I didn’t know but, when I heard snippets of such words as “wind” and “strolling,” I thought “How perfect is that? !” Tania’s music and mine were shuffling a variety: “Dances With Wolves,” James Taylor’s “You’ve Got a Friend,” Elton John’s “Yellow Brick Road,” ABBA’s “Dancing Queen,” David Guetta’s “Titanium,” etc. The steeple of a church came into view meaning that we were finally coming to Caldzadilla de la Cueza and, at the same time, KD Lang began singing “Halleluja.” “Halleluja indeed!” I thought. Coffee!!! Washrooms!!! It was when we came out of the cafe and were getting ready to walk again that AC/DC came on. I plugged one earbud into Dave’s ear so he could hear what I was listening to and he said, “No wonder you are walking so fast!” Once we got around the corner where no one could see me, I felt the urge to dance. Boots and poles moved in time with “I’m T.N.T. …I’m dynamite …watch me explode…” and helped get us to our destination in record time. Now I have new appreciation for AC/DC! I felt so much better that, when I passed a man who was also wearing earbuds I smiled, pointed to his earbuds and mine and gave him two thumbs up. Later after we had settled into our albergue, we went down for a cerveza and sat with him. He is Richard from Hamburg, Germany. He made a comment about how fast I was walking, so I said it had to do with my fast music. He was listening to slower John Denver music, so no wonder I passed him! Back at the beginning of our day before leaving the hotel we met a woman from Vancouver who had walked part of the optional riverside route to Villalcazar (our Day 24) the day after we did. The rain had turned the path to mud and she had no choice but to cut over to the main route alongside the highway. What a difference one day makes. It was a lovely route to take in the sunshine but certainly not in the rain. We were forwarned to have breakfast before leaving Carrion or to bring food with us since there are no cafes before Caldadilla de la Cueza, 16.1 km away. We paid attention to that advice and enjoyed a big, healthy breakfast at our hotel before heading out. 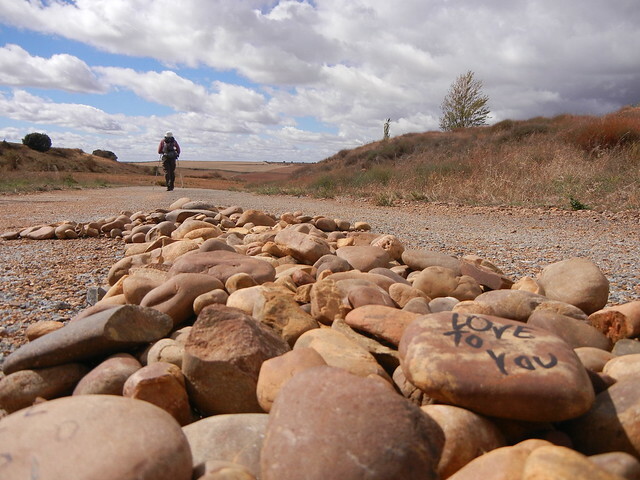 The first 3.7 km was on a quiet, paved road and then the remainder of our 22.5 km day was on a natural path, most of which is an old Roman road known as the Via Aquitana. The road’s surface is well above the level of the flat, featureless landscape surrounding it and the winter flood levels. 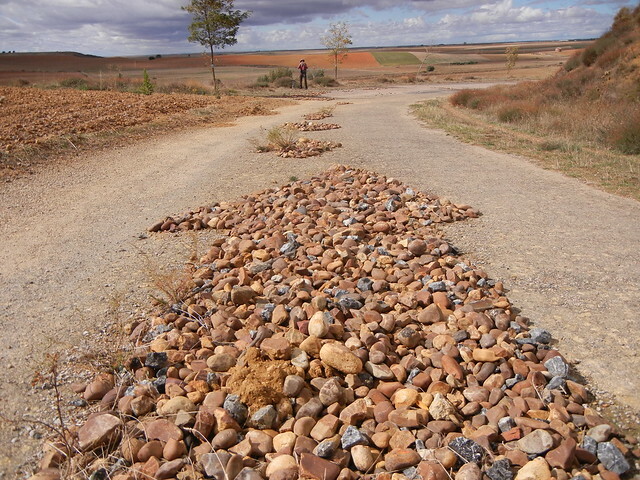 It has been covered with gravel so we’re not sure what part of what we were seeing was actually the old Roman road. Maybe none of it. Ever since Day 18 when I found a little brown rock for Tania (the day Dave and I lost each other), I’ve been looking for a heart-shaped brown rock as well. I found one that was not quite a perfect heart and was still looking for the perfect one. Today I found it on the Roman road. How cool is that? The problem is it must have weighed about twenty pounds! Dave and I had a difference of opinion about the weather this morning. To me it was intolerable because of the wind but Dave liked it. Given the choice between wind and flies, Dave prefers wind. When there is no wind, there are flies. He bought a bug hat in Carrion, though he has yet to wear it. He’s a real “fashion plate” in it. When I convince him to put it on so I can take his picture, I’ll post it here. Judy, you’re on!! Great writing.Personal, captivating, I feel we’re right there with you. Now I don’t have to ask all those personal questions about thoughts/feelings/people etc when you get home. Good mix, still including detail and background etc. Love it. Pictures also provide so much to the overall experience. Got some good stuff to do watercolors with when you get home. So glad you like the writing and pictures! I’m happy to be writing about our experiences because it helps us remember the details so that if and when we do this again (Dave says “no way”) we’ll be able to plan better. Also it’s fun having friends come along vicariously on our daily walks!